For the last 1 year or so, I always make sure that I sleep on a satin pillowcase every night when I'm home. I don't care if the rest of the bed materials are of a different design and color, because the benefits are worth the daily mismatch. I am telling you, it does wonders! My hair looks healthier and shinier than ever! And I really do mean 'ever' (say, 5-6 years ever.) And I don't see loose hair stuck on my pillowcase when I wake up anymore! If you have very frizzy, unruly hair, a satin pillowcase will calm it down. So, less stretching and pulling = Less fine lines and wrinkles. My eyes rarely look puffy in the morning too, thanks to my darling satin pillowcases. If you haven't already got one, you gotta go get it now because I think a satin pillowcase will do what some anti-aging creams and hair treatments with empty promises will never do. oh wow. it looks really comfortable and soft. That's the first time I've ever heard of a pillowcase like that. I might probably get it if it isn't too expensive. How much is it? Hey thats a cute and informative blog. A new one too !!! I'll have this in my mind during my next purchase. Thanks Cynthia !!! I knew the hair part..but I guess it makes sense for the skin too. Where did you get yourself the pillowcase from? I never find any good ones..its that cheaper kind you told that I find more often. will change my pillowcase right away but on coming weekend. Thanks hun!! hey cynthia....thanks for responding..do u suggest remington wet 2 straight?....i really dont want to soend alot on flat iron coz i dont straighten my hair everyday....and yeah my hair aint thick.just normal i guess.. I've read about its benefits before but sadly, I never took action. What a crime! I couldn't agree with you more Cynthia. I have been sleeping on satin pillowcases for a few years now and my hair and skin have never felt or looked better. I urge anyone who wants to stop waking up with pillow lines on their face and dried out hair to sleep on satin. You'll be very happy you did and wonder why you waited so long. You can find them online. If you're looking for a great place with great selections go to A Touch of Satin. 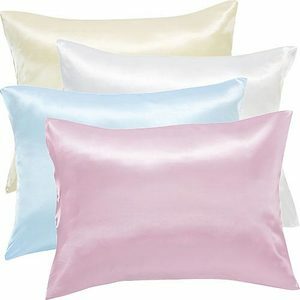 They have over 20 solid colors to choose from and they are all charmeuse satin.